Comic Book Movies are 80 years young, and bigger than ever before. Shazam just struck a chord with fans, and the Marvel Cinematic Universe soon will hit its crescendo with Avengers: Endgame. Sandwiched in-between is Hellboy, the reboot of Mike Mignola’s occult icon. Hellboy was first brought to screens in 2004 by Guillermo del Toro. He took the source material and made two magical movies. They were unique from the comics, far less inspired by them than the new reboot. Director Neil Marshall’s Hellboy takes a lot of inspiration from the Comic and offers David Harbour a long overdue lead role in a major motion picture. Sadly Marshall‘s Hellboy is much hijinks and little heart. This Hellboy is saturated in vulgarity, the kind that caters to a very specific demographic, skewing young males. The Script is equally saturated in call-outs to the Comics. It feels like a million moments are being squeezed into 120 minutes. In its fast pacing, it also can feel discombobulated. It’s like the first two Hellboy movies mashed into one; an origin story and a world-ending war between realms. The Visual Effects team does drum-up some good sequences, a lot of which are in the Trailer, with the rest being fodder for the R-rating. The performances get lost in it all, including Harbour’s standout effort, and little comes up for air to be celebrated. 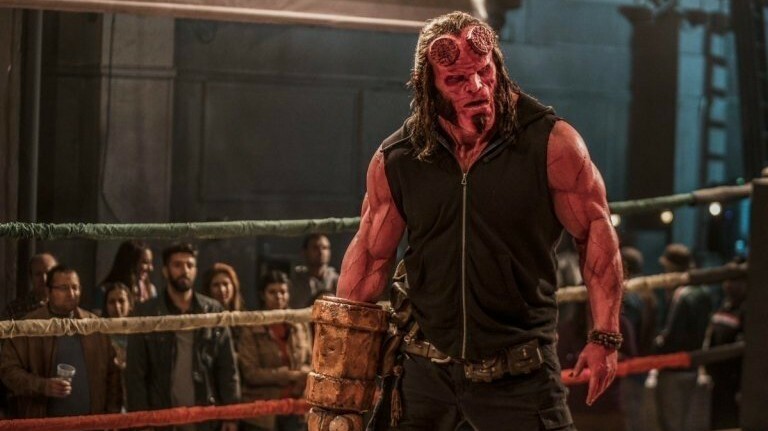 While it’s bound to be compared against the originals, Hellboy nevertheless finds a fan base in those who enjoy its violent and graphic excess.